I know that for a lot of folks the weather this week has been an absolute scorcher. But here in San Diego, we’ve kind of been experiencing the opposite (but not at all severe) phenomenon…it’s actually been a bit cold and blustery. In fact, I nearly turned the car around as I was taking my kids out to the Wild Animal Park – the fog was dense and drizzly on the way out there and my duo are still pretty little. 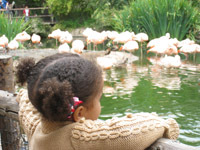 Fortunately, the sky cleared up and we had a blast with the flamingos, meerkats and gorillas. I’m sending over some of this cool, misty weather to everyone who’s still experiencing triple-digits. For when the temps climb back down, bookmark this zesty, cheesy recipe to try. Preheat the oven to 350°F. 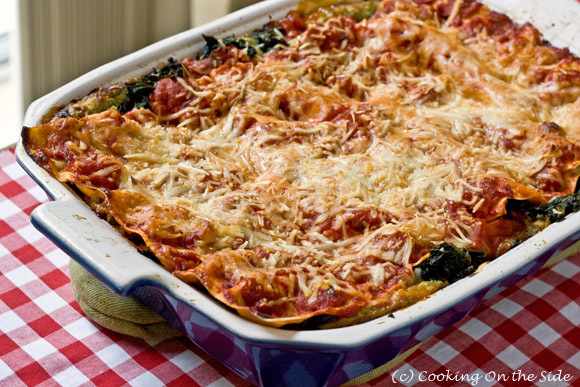 Spray a 13×9-inch baking dish or lasagna pan with cooking spray. Spread 1/2 cup pasta sauce in the bottom of baking dish or pan. In a bowl, mix together ricotta cheese, egg and pesto until thoroughly blended. 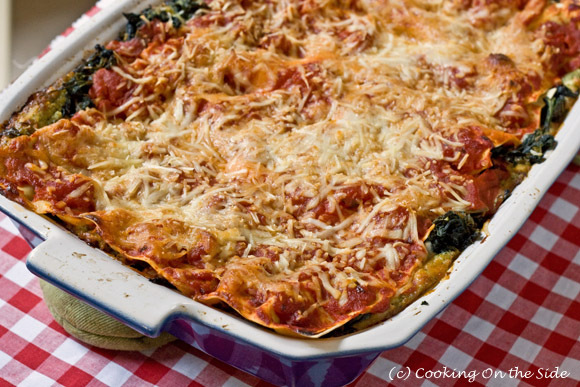 Layer noodles, ricotta and pesto mixture, spinach, 1/2 cup Parmesan, 1 cup mozzarella and 1 cup pasta sauce. Repeat layers using remaining ingredients. Bake for 1 hour. Thanks for sending us a reminder that there is cool weather somewhere; it’s surely not here in New England! This recipe is one I will save for the future. I always have pre-shredded cheese in the refrigerator, whether store-bought or my own leftovers. Can I make this using fresh spinach? Absolutely! I’d blanch it first, though. And be sure to drain as much of the liquid as possible. Thanks for sending the misty weather, and I’ll take a helping of that lasagna as well. Yum! hmm… i haven’t ever thought of spinach and pesto together. looks delicious!